The most memorable parties are like a symphony. A beautiful melody of good wine, witty banter, and a soundtrack that sets the mood. 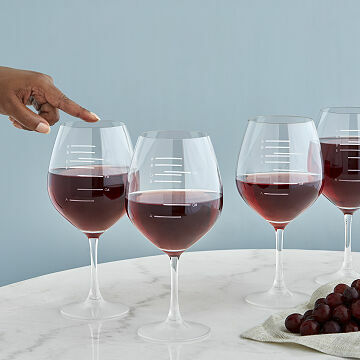 Keep your next gathering from falling flat with these cleverly designed wine glasses. Fill to the desired note, run a finger around the rim, and congratulate yourself on creating crystal-clear sound. If you have enough on hand, you may be in for a real concerto. Glassware made in Germany. Decorated in Reno, Nevada. Patented 2014. Check out the party set! Fill lines and full underside of glass foot are sandblasted. I gave our choir director four glasses for Christmas a year ago and have completed the octave over her birthdays. She has already downloaded the music on the website and can't wait until our next choir party! Review of musical wine glasses. It's just wonderful that they create musical notes when you fill the wine to different levels. My dad is so excited to show them off at his next get together with his singing buddies, and just thinking of the joy they'll bring him and everyone in the group makes me happy. For me, the best thing a gift for my dad can be is thoughtful, unexpected and surprising, but just right for his life - like this was. Have colleted a complete set!! I want to buy them for everyone! These wine glasses are GREAT! They are fun, they make you smile and the glasses are huge! I have the perfect person in my family to buy them for and I cannot wait to give them to her! She is a bit of a wine connoisseur and a beautiful musician! It's like they were made for her. It was a great gift I think and a unique interesting thing to share.